“You’re going to see a lot of flags. You’re going to say, ‘What’s going on here? These people must be flag-crazy,’” Eduardo Arocho tells a group of students from Chicago’s Exeter College as they stand below the towering 30-ton steel-and-concrete Puerto Rican flag that marks the entrance to Paseo Boricua, a mile-long stretch of Division Street in the Humboldt Park neighborhood. 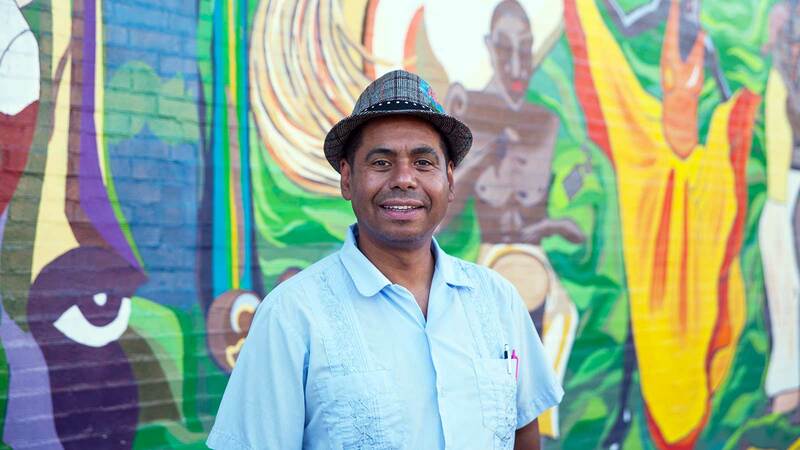 Arocho, 47, is executive director of Division Street Business Development Association (DSBDA), which serves as the chamber of commerce for Paseo Boricua, and he leads neighborhood tours popular with schools and business visitors. He explains that Paseo Boricua’s two massive flags pay homage to the steel and welding jobs held by many Puerto Ricans in Chicago after a mass movement from the island to the mainland following World War II. Moving has long been a reality for the Puerto Rican community in Chicago. They came here in droves starting in the 1940s with Operation Bootstrap, a federal program to restructure Puerto Rico’s economy. Thousands have continued to arrive in recent years, especially as the island suffers an economic crisis and now the effects of Hurricanes Irma and Maria. Puerto Ricans originally settled in Lincoln Park and surrounding neighborhoods, but many were forced to move as property values rose. “Every time a community of color is moved, they get poorer, while the new people who come in get richer,” Arocho tells the Exeter students, who snap their fingers in agreement. Community leaders like Arocho don’t want to see that happen again, so they are working hard to foster investment and stability in Humboldt Park, cementing and celebrating the neighborhood’s Puerto Rican identity in a way that welcomes visitors and newcomers but also helps long-time, local residents stay and benefit from the increasingly prosperous environment. “We have a saying in Spanish — ‘planteando una bandera’ (planting a flag),” Arocho tells the students. In part this means commemorating the area’s Puerto Rican identity and history through such things as the flags, countless murals, and metal banners on light posts that reference the three ethnic roots of Puerto Rico: West African, European Spanish, and indigenous Taino, from whose language the word Boricua comes. “Planting a flag” also means economic development that relies in part on tourism and investment from people outside the neighborhood or even outside the city but “creates a revolving dollar,” as Arocho puts it — profit for locally owned businesses that is invested back into the community. "Sea of Flags," at 2500 West Division Street, was painted in 2004 by Gamaliel Ramirez with assistance from Star Padilla, Moncho, Luis Ortiz, Melissa Cintron, and other community members, and is a stop on Eduardo Arocho’s neighborhood tour. Photo by Kaitlynn Scannell. Arocho grew up in Humboldt Park and first became keenly aware of his and the neighborhood’s Puerto Rican heritage while a student at Northeastern Illinois University. An article about a statue of Dr. Pedro Albizu Campos in Humboldt Park led Arocho to the story of the Harvard-educated lawyer and labor leader, a legendary figure in Puerto Rico’s struggle for independence and human rights. Soon Arocho was volunteering as a docent at the National Museum of Puerto Rican Arts and Culture in the park, leading bus tours of Humboldt Park for the Chicago Cultural Center, writing and performing poetry related to Puerto Rican identity, and working with DSBDA, a business incubator that provides startup office space, training, financial support, and other assistance for new and existing businesses. One of DSBDA’s success stories is Ciclo Urbano, a bustling bike shop on Division Street. DSBDA helped Ciclo Urbano launch in 2009 as a for-profit outgrowth of the non-profit organization West Town Bikes. Today the general manager of the bike shop is Anthony Cruz, 23, who was a youth apprentice at West Town Bikes a decade ago. He has trained many local youth as bike mechanics and advocates, helping them to apply for jobs at other bike shops or come back to work at Ciclo Urbano. Cruz says he’s seen Humboldt Park change drastically since his childhood, with new condominiums and trendy boutiques popping up. He worries about gentrification. But he said the work of DSBDA and small business owners who support each other is crucial to helping Humboldt Park develop and advance without losing its long-time residents. Across the street from Ciclo Urbano are the Teresa Roldán Apartments, a beautiful yellow building that appears to be plucked off the streets of Old San Juan. It houses 56 affordable apartments for seniors. Arocho notes that DSBDA is working with the Puerto Rican Cultural Center and other partners to create additional affordable housing projects, including a live-work building for artists that Arocho has been pushing for more than a decade. The Puerto Rican Cultural Center has long combined advocacy for human rights on the island with programs serving and empowering Puerto Ricans in Chicago. The center’s numerous projects in Humboldt Park include Dr. Pedro Albizu Campos Puerto Rican High School, an alternative school; the organization El Rescate, which provides housing for homeless LGBTQ youth; the Vida/SIDA organization for HIV prevention and services; the arts venue Café Teatro Batey Urbano; and the restaurant and gathering spot Café Colao. Arocho notes that when he started working with DSBDA in 1994, there were only about three restaurants on Division Street. Now there are about 10 Puerto Rican restaurants on the strip, with several more in the works. DSBDA support is facilitating a major expansion of Papa’s Cache Sabroso, a popular restaurant offering chicken and traditional jibarito sandwiches, made with fried plantains instead of bread and filled with thinly sliced meat and cheese. The restaurants, like the neighborhood’s art galleries and stores, aim to serve the local population as well as people from throughout the city and beyond. A warm, welcoming approach is intrinsic to Puerto Rican culture, Arocho notes, and it’s also a smart economic strategy. “Everyone likes jibaritos, and the restaurants here can’t survive on Puerto Ricans alone, especially since every Puerto Rican’s mother makes [jibaritos] better” than the restaurants, Arocho jokes. His tours often include a meal in a local restaurant. He sees the tours as central to his mission of fostering development and stability in the neighborhood while also increasing awareness of the culture, struggles, and achievements of Puerto Ricans in Chicago and beyond.